Here, I am going to explore BackboneJS. 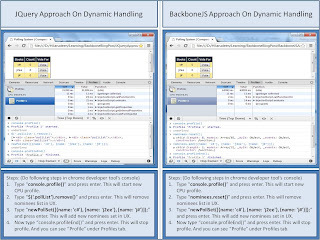 Since I am newbie to client-side MVC, it seems to be very hard to understand the concepts of BackboneJS. This was making me frustrated initially. So that, I decided to go back to some traditional approach and do step by step analysis toward modern approaches. Now I am taking simple concept to explore these things. 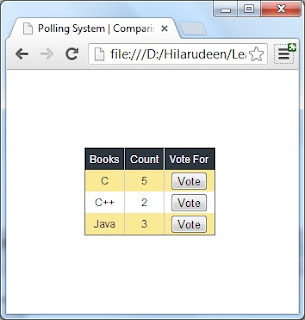 So I have designed simple "Polling System" that looks like as follows. To easy understand, I am giving little introduction about this image. Here I have listed out some computer programming languages and given a button to vote for your favorite language. And the middle column "Count" shows that how many times, you clicked the "Vote" button. 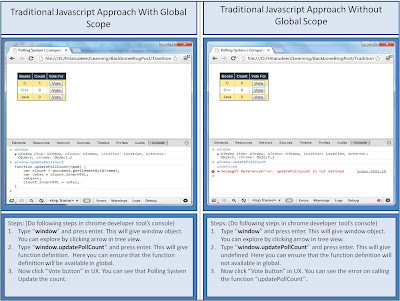 Since I am talking about dynamic web pages, and to find answer of the above asked question, I am going to add a little dynamic manipulation in the "Polling System". Let's assume, you can allow only three nominees in the "Polling System" and allow the user to select their favorite nominee at a time. And after the winner is selected, then you can allow another three of nominees into the "Polling System". 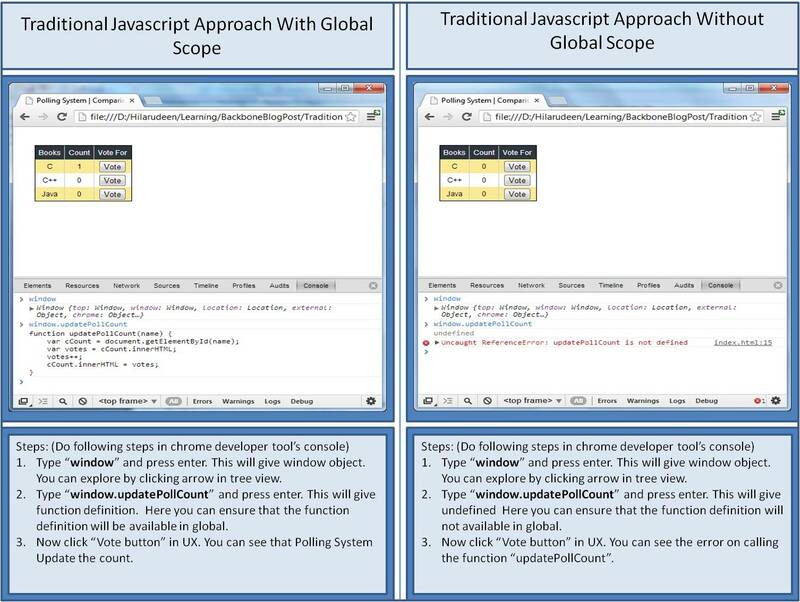 Here once first winner is selected, adding another set in the "Polling System" is going to be happen dynamically. 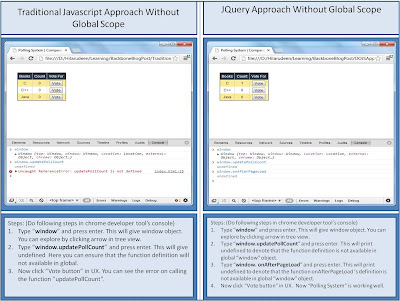 I have implemented this by using jQuery and BackboneJS in separate code base. And I have compared them based on their execution time. 1. "Self" Column indicates time, spend on executing the function which is shown under function column. 2. "Total" Column indicates cumulative time, spend on executing the function and the functions which are presented in current function's call stack. In above comparison image, You can ignore (idle) and (garbage collector) times and remaining times are indicating time spend by CPU while execution. In this experiment, the code implemented in jQuery has taken (19 + 21 + 0 + 1 + 1 + 2) = 44ms. And the code implemented in BackboneJS has taken (9 + 14) = 23ms. 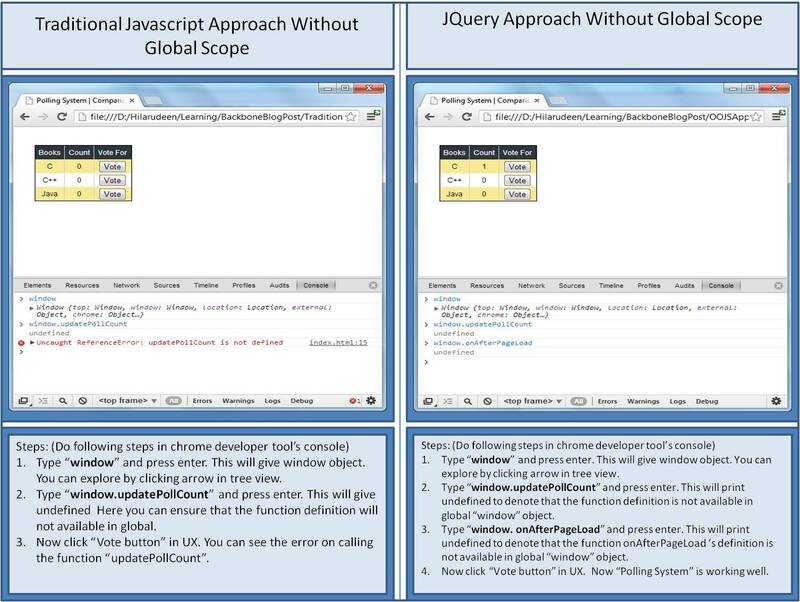 This is clearly showing that BackboneJs is faster than jQuery. I repeated the experiment many more times. I saw that BackboneJs always consumes less CPU time. 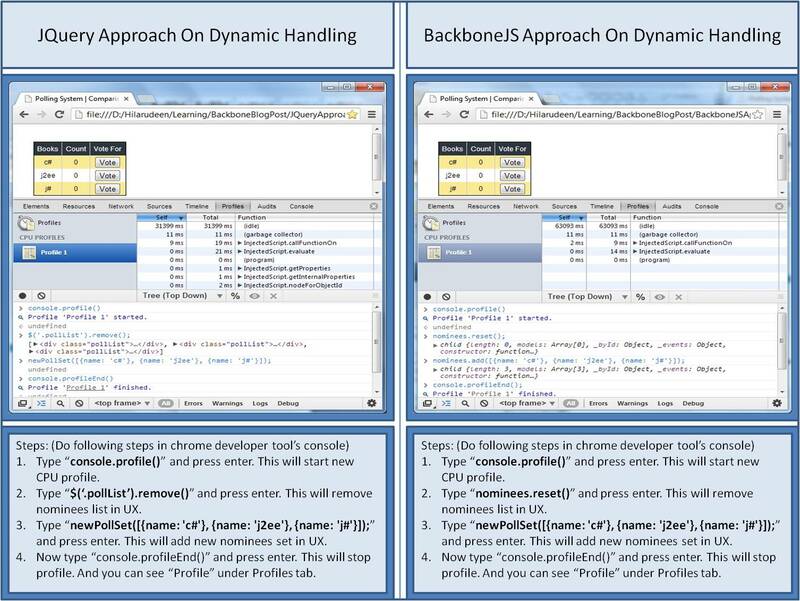 Now I am happy to use BackboneJS on handling dynamic web pages. Guys, I hope that you all enjoyed.